Beth and Mike Eaves were brought to tears recently when their son presented them with a framed bachelor of arts diploma. Patrick Eaves surprised his parents with a perfect early and emotional Christmas gift. 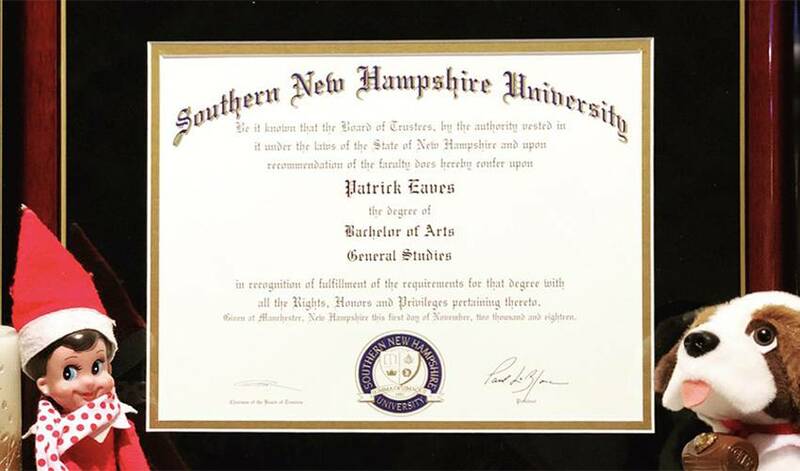 Beth and Mike Eaves were brought to tears recently when their son presented them with a framed bachelor of arts diploma from Southern New Hampshire University. When Eaves, now a forward with the Anaheim Ducks, decided to leave Boston College after three years to sign with the Ottawa Senators in 2005 – his mom wasn’t happy. But he promised her one day he would finish his degree. Thirteen years later, Patrick, now 34, kept his word. “Education always has been important in our family,” Patrick said. “My mom has a bachelor’s degree and a masters. So does my brother [Ben]. My dad has his bachelor’s. Eaves already has accomplished plenty in hockey. He won gold at the 2004 world juniors with the United States in Helsinki, Finland, with his father as head coach. He went to the Stanley Cup Final with the Senators in 2007 and became a dependable two-way forward with Ottawa, the Carolina Hurricanes, Detroit Red Wings, Nashville Predators, Dallas Stars and now the Ducks. But as his pro career progressed, Eaves watched the clock ticking on his promise. He found Southern New Hampshire University (SNHU) through his CDP advisor, Duncan Fletcher, and was hooked up with SNHU academic advisor Heather Roberts. Fletcher and Roberts helped transfer as many credits as possible from Eaves’ time at Boston College. It turned out he was 13 classes short, so Eaves pecked away at his studies with online courses over a four-year period. Going back to school after last sitting in a classroom in 2005 was not easy. He had to regain his study and writing habits. He had to fit in his studies around a busy family life – he and his wife Katie have three children. He also had to deal with life on the road. Road trips aren’t easy with teammates involved in video and card games as well as the usual hijinx. But Eaves dedicated himself to hitting the books as much as he could at home, on the plane or in his hotel room. Persevering through to attain his diploma was a special ending to a difficult period in his hockey career. Eaves was hospitalized by a mystery illness last season. After just two games he experienced soreness in his legs and shortness in his breath. He finally was diagnosed with post-viral syndrome, an illness from a virus that causes fatigue and muscle pain. Last March, as he was pushing himself to return to action, Eaves suffered a shoulder injury that required surgery. He played his first game in more than a year on Nov. 1, but five outings into his comeback he suffered back spasms as the result of playing with a broken rib. “I feel fine now,” said Eaves, who was born in Calgary, but raised in Faribault, Minnesota. He’s still on the Ducks’ injured reserve list, but earning his diploma has eased at least some of his pain. In this week's Player Q&A, we find out why Patrick Eaves is the back-to-back, defending Smashfest Champion. His dad played with Hockey Hall of Famers Wayne Gretzky, Dale Hawerchuk and Mark Howe, but Max Jones still received plenty of advice on becoming an elite-level athlete from his mother. Adam Cracknell is back in the show.